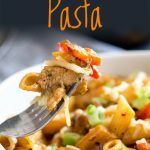 This Easy Creamy Cajun Chicken and Sausage Pasta is one of those dinners that takes under 30 minutes to cook but is always a hit, making it perfect for families and those nights when dinner just needs to be on the table quick. With juicy chicken and flavor packed sausage, this creamy pasta dish is pure comfort food. The creamy sauce is flavored with cajun spices and garlic but the level of spicy is up to you, add as much or as little chili as you like. A pasta recipe that never fails to disappoint. To make Cajun chicken and sausage pasta, the chicken is first mixed with the cajun spices giving them a chance to permeate the meat. The sausage is then cooked off in a little oil, this starts to flavor the oil, so you can cook the vegetables off in that same oil. You want to ensure you cook the vegetables over a high heat as this is what starts to charred the edges. This slightly bitter char balances with the cream and cheese and works with the cajun spices. So don’t be afraid to use a high heat. Once the vegetables are lightly cooked, add the chicken breast chunks and color in the oil over a medium-high heat. The Cajun sauce is then made with and a mixture of chicken broth and half and half, before being thickened with cornstarch. It is this creamy sauce that adds so much comfort to the dish. The answer here is you are in control. The level of spiciness is completely up to you. The recipe calls for plenty of Cajun spice blend, but this adds flavor and depth without any heat. If you like it hot then there is the optional step of adding chili or ground cayenne pepper. Both will add extra heat to the dish. But if you are feeding children who don’t eat spicy foods (like my youngest!) then don’t worry the dish is perfect without the need to add the chili hotness. 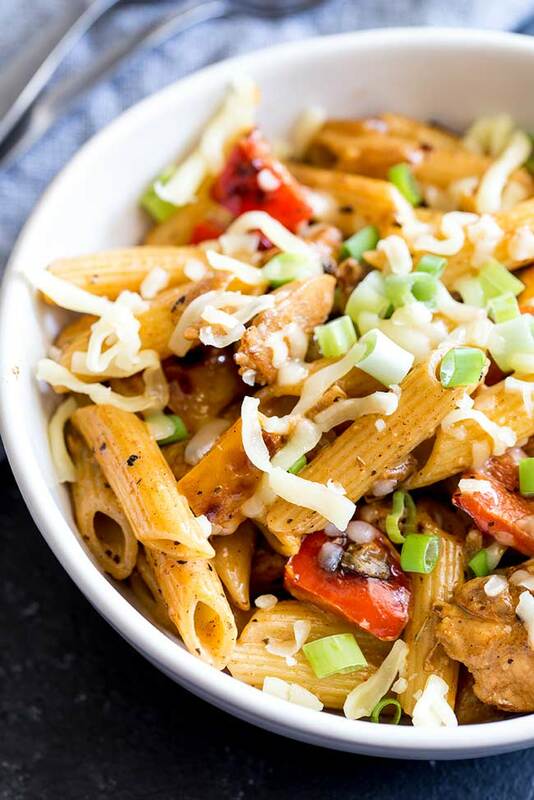 This recipe is not traditionally Italian but instead is inspired by the famous Cajun Chicken Pasta from Chili’s Grill and Bar. Although unlike Chili’s version here the chicken is cooked in the sauce to pack even more into every bite and making it much easier to make at home. 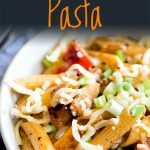 If you are after a more traditional Italian pasta dish then why not try my Creamy Rosemary Chicken Pasta. 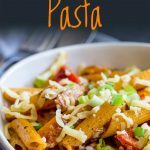 What kind of pasta to use in Cajun Chicken and Sausage Pasta? I made mine using penne pasta but rigatoni or ziti would be great choices. You could even try a long pasta like spaghetti or linguine. 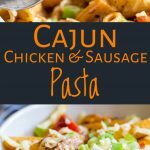 What kind of sausage is used in Cajun Chicken and Sausage Pasta? The key to which sausage to use comes down to the smokiness and spiciness of the sausage. I like to use an Andouille sausage, which does have some spice to it. But when I am making this for the kids I will pick a smoked sausage, which is milder in spice. Can I make my own Cajun Seasoning? You sure can, in fact I have a recipe here on Sprinkles and Sprouts! On the side: To soak up all the creamy Cajun sauce serve this with a side of garlic toast and for a healthy option add a side of 5 minute Sautéed Sugar Snap Peas. Drink: The Cajun spices here work fabulously well with a well chilled brown ale. Something with a hint of sweetness and smoky notes. If you prefer wine then an unoaked Chardonnay will pair well with the spices or my personal preference is a lightly chilled red Zinfandel. 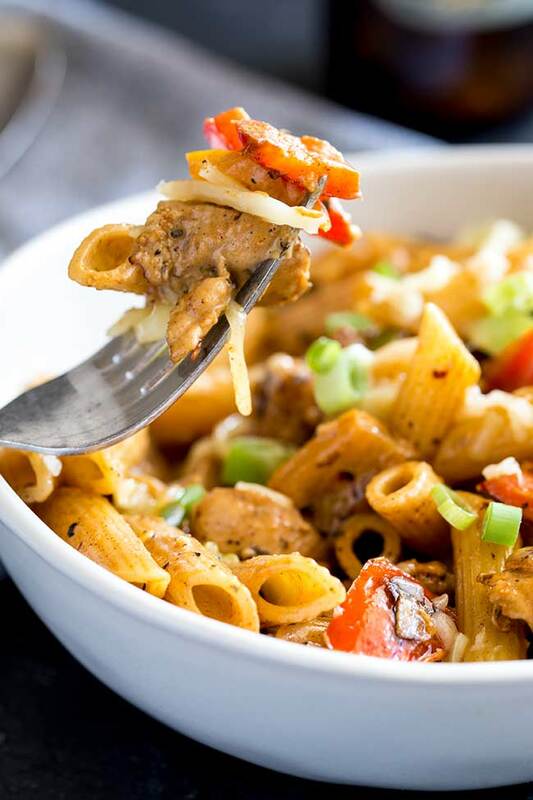 Pin this recipe for Cajun Chicken and Sausage Pasta. Pin it here. 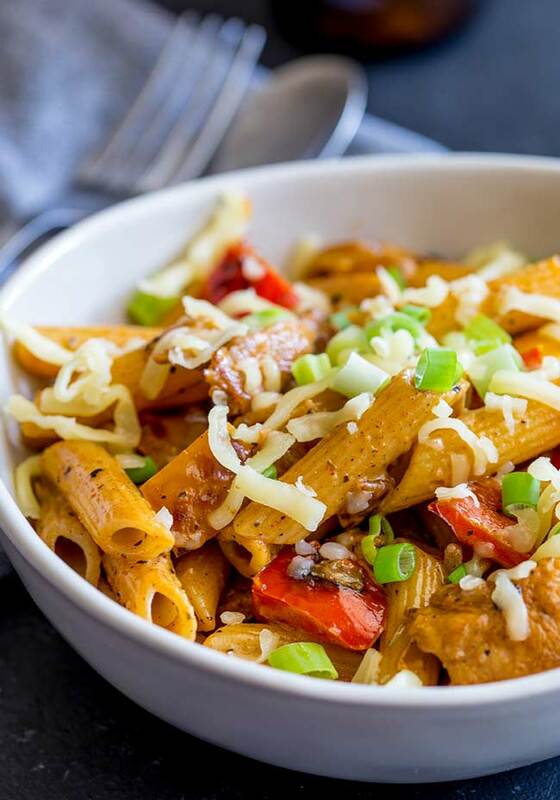 For an easy midweek meal, why not try this Creamy Cajun Chicken and Sausage Pasta. Ready in under 30 and perfect for the whole family, this mildly spicy creamy pasta recipe is sure to be a hit. 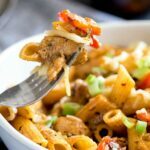 The chicken breast chunks and smoky sausage are cooked together with red bell peppers, onions, and garlic, as the basis for a wonderful creamy sauce flavored with cajun spices. You can add some chili if you like it hot, or leave it out for feeding families. Cut the chicken breasts into 2-inch chunks. Place the chicken in a bowl, add the Cajun seasoning, the paprika, and the ground pepper. Stir well to coat and set to one side. Slice the sausage into 1/2 inch rings. Peel and chop the onion, then chop the bell peppers into bite-sized chunks. Heat the olive oil in a large non-stick skillet or fry pan. Add in the sausage and cook over a medium-high heat for 3 minutes until starting to color. Add the vegetable and cook over a high heat for 3 minutes until softened and starting to char. Add in the crushed garlic and the chicken, reduce the heat and cook on low for 2 minutes. Whilst the chicken is cooking bring a large pot of water to boil and then add a good amount of salt. Add the pasta and cook for 1 minute less than the packet suggests. Add the chicken broth to the chicken and vegetables, and bring to a simmer then add in the half and half and bring back to a simmer. Cook for a further 4 minutes or until the chicken is cooked through. Add the pasta to the chicken along half of the shredded cheese. Stir everything together adding the pasta cooking water until the sauce is at the consistency you want. Serve with the extra cheese and a garnish of green onions.